Craig Cunningham and Josh Walsh. THE 2012-13 cricket season has now come and gone and hasn't it flown! The season gave us much to reflect on and looking over our own clubs from the Derwent Valley and Central Highlands, I would have to say its been a very successful summer. Molesworth I and Bushy Park made their respective grand finals and while they didn't take home a shield, they fought it out to the end. To make the finals is one thing, but to play off in the grand final is another. Molesworth has now played in the past three 2nd Grade grand finals, winning in 2010-11. Bushy Park has made the big one in 4th Grade for the past two seasons. 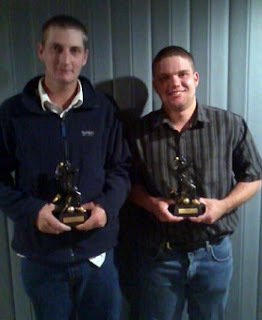 New Norfolk II player Richard Munnings won the 5th Grade player of the year. Craig Cunningham who plays for Gretna I in 2nd Grade won the bowling average with 13.40 and took 30 wickets. Josh Walsh took out the 5th Grade bowling average with 9.46 and took the big total of 39 wickets. Gretna I (2nd Grade) and New Norfolk II (5th Grade) played in the finals for the first time since joining the Southern Cricket Association back in 2008-09. New Norfolk I made the huge score of 8 for 398 off 50 overs and also 5 for 369 off 50. Molesworth I made 7 for 361 off 50 while Gretna I made 5 for 355 off 50 overs. Although not one of our clubs, no one got close to McRobies Gully's score of 8 for 517 off 50 overs! This season we witnessed some great batting performances, both individually and in partnership. New Norfolk I player David Maddox topped the chart with a superb 171 against Bagdad in Round 16. Gretna I captain Ben Rainbird also knew how to handle the willow, smashing 170 against Sandford in Roundd 18. In Round 6 New Norfolk I player Rohan Heron belted 166 not out against Derwent. New Norfolk II players Josh Rowlands and Leigh Berry belted 222 together for the third wicket against Richmond/Cambridge in Round 9. Berry then teamed up with Richard Munnings, putting on 200 for the second wicket against Molesworth in Round 15. Berry made 130 in this match. Rohan Heron and David Maddox shared a 195-run stand against Bagdad in Round 16. Maddox also shared a 147-run stand with Stewart Rice against Runnymede in Round 17. Long-time Gretna players Ben Rainbird and Glenn Blackwell put on 167 together against Sandford in Round 18. Their team mates Tom Allcock and Aaron Maddox also did well, putting on 148 for the ninth wicket against Bagdad in Round 12. Of the bowlers, no one could match the magical performance of Josh Walsh who sent down 10 overs - three maidens 8-25, now that's having a crack! Walsh took five wickets or better three times in 5th Grade and also when called up took wickets in 2nd Grade. Great effort Walshy. Molesworth captain Ricky Martin took 6 for 30 against Sanford in Rd 17. His team-mate Brad Coppleman took 6 for 48 against Gretna I in Round 16 and 5 for 37 against Sandford in Round 8. New Norfolk I player Jamie Maddox took 5 for 16 against Sandford in Round 5. Bushy Park player Nathan Grant liked playing the Derwent club - he took 5 for 10 in Round 5 and 6 for 39 in Round 16. Not to be outdone, young New Norfolk II bowler Mitchell Rice took 5 for 41 against Sorell in Round 3. Bushy Park's Troy Smith finished second in the 4th Grade bowling average with 10.03 and 30 wickets. New Norfolk I all-rounder Stewart Rice finished third in the 2nd Grade bowling average with 13.77 and 30 wickets. Ricky Martin (Molesworth) finished equal third with Mathew Burns (Gretna) and Danny Thompson (Runnymede) for the 2nd Grade player of the year. Mitchell Crosswell finished third for the same award in 4th Grade. Former Gretna player Mark Gillard umpired his 500th cricket match, now that's a lot of umpiring! "Oscar" became only the third to join the 500 club. Gretna II player Sam Kirkwood made my report and also featured in the Mercury during the season all for the wrong reasons, being hit for six sixes off one over and on his fifth ball bowled wide so he went for 37 off one over and finished with figures of 0 for 57 off 2 overs. A great moment for the Grant brothers who play for Bushy Park - Nathan, Trent and Dylan - was when they were joined in the team by their father Scott. This doesn't happen all that often, so well done guys. On a sad note we said goodbye to player Ben Eyles and former player Tony Woolford; both will be sadly missed. On a brigher note, what about the Tasmanian Tigers who came from second-last on the ladder to make the final and then win the Sheffield Shield over Queensland at Bellerive? Well done Tigers and also Tim Coyle who finished as coach on a real high. Before I finish, I would like to say a big thank you to all office bearers and their committees who run the clubs Without you the matches would not go ahead. Look after these people as they look after you. Well, until next season its stumps for me, Quick Single. Thanks for yet another great season of cricket in the Derwent Valley.